One Patience Ohelimo, a native of Abakaliki, Ebonyi State, has accused her husband, a pastor, of alleged plans to sacrifice her for ritual purposes. 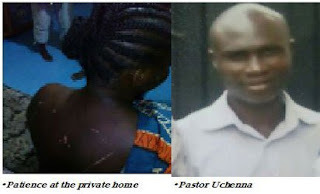 Patience, who is currently undergoing treatment at a private home in Ilishan Remo in Ogun State, told Vanguard that she was tortured, gang-raped and almost sacrificed for ritual purposes in Port Harcourt, the River State capital, by her husband, Uchenna Joseph, and some unknown persons. Patience said, “I was a petty trader in Ikorodu town in Lagos before my plans to get married, while my husband was a full time pastor. “We were to have our wedding introduction in 2014 and were planning for a church wedding when I got pregnant, which put the wedding plans on hold. “In the course of our relationship, I expended all my earnings but this was not in vain as I gave birth to a boy in February 2016. “Three months after, my husband suggested we should visit his friend in Port Harcourt to raise fund for my business. So we left our base in Ogun State and during our three months stay, I became a prophetess and also assisted in evangelism, but on one fateful day, my husband conspired with his friends to sacrifice me for ritual purposes. “My refusal earned me incarceration as they tortured and gang-raped me. This took place for a number of days until I reached my sister through a text message and she came to my rescue. “They separated me from my son and were about tying me to the ceiling fan when my sister arrived the one-room church. My wedding gown and other items were kept for two years as he is yet to complete the dowry,” she lamented, vowing not to return to her cleric husband. “I have spent all my earnings on this marriage which has almost cost me my life and I will never return to that home,” she added. But the cleric, on his part, debunked the allegation by his wife. He described it as a conspiracy and a ploy to get unnecessary attention from members of the public as he was yet to complete the required money meant to pay as dowry on his wife. Pastor Uchenna alleged that his wife was both psychologically and emotionally imbalance during their stay in Port Harcourt. He said, “She used to see visions and loved evangelism but one day, she was on evangelism field with my friend’s relative when she was spiritually attacked and she started exhibiting strange behaviour. “But my mistake was that I did not inform her parents believing it was a minor issue until she became violent and we had to seek spiritual help by inviting some pastors to conduct deliverance for her. “She however sent a message to her elder sister and I was misunderstood. The scars on her body were as a result of the violent situation she found herself. “How can I connive with others to kill the mother of my baby? Her family was just being harsh on me for failure to complete the dowry because out of N100,000, I only paid N40,000,” he added. Meanwhile, as Patience continues her spiritual and medical treatment, a case was lodged at the Ilisan Remo Police Division for investigations, where a source at the Division who pleaded anonymity said the Police was conducting a thorough investigation on the case and noting that the matter was more of a family issue.